HRH The Premier touring Gulf Industry Fair 2018 after inauguration. The 11th edition of the Gulf Industry Fair (GIF), the Northern Gulf’s leading specialist business-to-business (B2B) event for industrial products and services, opened today (February 6) at the Bahrain International Exhibition and Convention Centre. 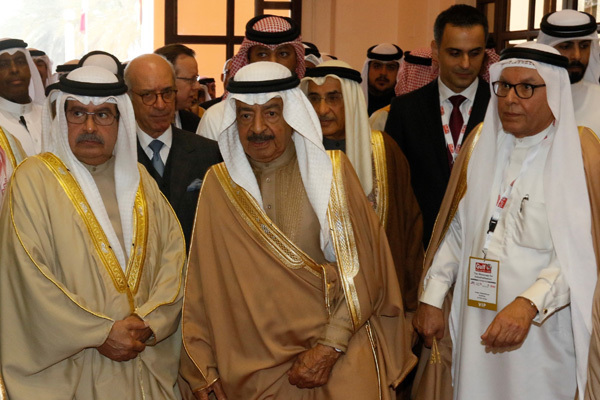 The three-day event was inaugurated by the Prime Minister of Bahrain, HRH Prince Khalifa bin Salman Al Khalifa. The exhibition, organised by Hilal Conferences and Exhibitions (HCE), focuses on industrial development and innovation through a series of initiatives and activities. The high-profile expo offers companies direct access to a dynamic multi-billion-dollar industrial marketplace and the opportunity to showcase their products and services to a targeted B2B audience consisting of procurement managers, industrialists, purchasers, consultants and decision makers from the region and internationally. Leading industry leaders showcasing their products at the event include AKGEC, ASNU, Audi Transformers, Al-Ahleia Switchgear, AXA Power, Bahrain Pack, Beka, Bobcat, Doorking, Eazy ERP, Ebara, EMSA, Gossen Metrawatt, Grove, Hyster, Kohler, Lincoln Electric, Manati, MAC Valves, Mahendra Pumps, Metabo, Midal Cables, Manitowoc, Molex, Omicron, Osaki, Perkins, Rexton, Rockwell Automation, Schneider Electric, Taishanbrand and Thorn Security. Gulf Industry Fair 2018 is being held against a backdrop of falling revenues from oil, bringing into sharper focus the decision by GCC governments to accelerate their economic diversification programmes, said the organisers. "Despite a regional economic slowdown caused by low oil prices in recent years, ongoing investment in the GCC’s industrial infrastructure remains strong," remarked Jubran Abdulrahman, the managing director of HCE. "Notably, Saudi Arabia’s long-term 2030 Vision is likely to be a key driver of the Gulf’s industrial ambitions in the coming years, as the region’s biggest economy accelerates diversification efforts," he stated. Abdulrahman pointed out that Gulf Industry Fair 2018 will build on the legacy left by previous editions of the show. "We are grateful for the unwavering support of the Prime Minister, HRH Prince Khalifa bin Salman Al Khalifa, in helping to establish Gulf Industry Fair as the ‘go to’ exhibition for companies operating in the Northern Gulf’s expanding industrial markets. We are committed to providing the ultimate networking, knowledge-sharing and deal-making platform for all companies involved in the industrial sectors," he added. This year's edition of GIF enjoys the strategic support of Aluminium Bahrain (Alba), Bahrain Petroleum Company (Bapco), the National Oil and Gas Authority (Noga) and Bahrain Investment Wharf. The Industrial Facilities Sector is championed by Majaal. “We are proud of the quality of this year’s line-up. GIF 2018 sees the launch of the Solar Utilities Network (SUN) promoting renewable energy and the commercial opportunities that will contribute to Bahrain’s industrial development," remarked Abdulrahman. The Prime Minister inaugurated the Network today by switching on the SUN logo powered by a solar tree. The debut SUN initiative will focus on the latest trends in the solar and renewable energy sector and how the industry can benefit from them. "In addition “Made in Bahrain” manufacturers will be promoting the country’s capabilities in addition to world-class industrial facilities which will add to the business proposition of the kingdom to international and regional investors," added Abdulrahman. The exhibition is an annual celebration of the industrial drivers of the growth in the GCC’s economies. GIF promotes the key industrial segments of Aluminium, Industrial Processes and Manufacturing; Industrial Metals (Steel & Alloys); Energy & Environmental Protection; Industrial Facilities; Ports & Maritime Industries; Training for Industry; and Fire, Safety & Security. Innovative products showcased at GIF include: tooling, solar energy, wireless electricity transmission, smart technology, robotics, floating facilities, aluminium wheels, lighting poles, valves, specialised industrial paints and coatings and compressors. "Industrial development will require energy to fuel growth. Today, energy requirements are not only about cost-effective power generation but also have to consider environmental concerns," stated Ahmed Suleiman, the exhibitions director of HCE.